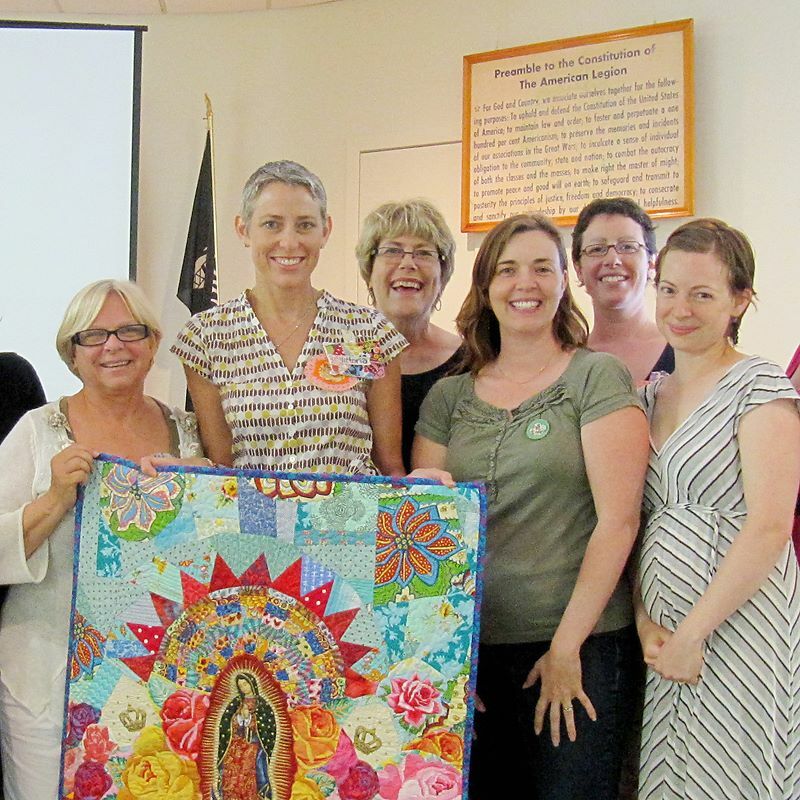 Last weekend I had the pleasure of traveling from DC to Bedford, PA with 4 other members of the DC Modern Quilt Guild to spend 2 nights in the retreat center of Mary Koval’s Quilt Shop. 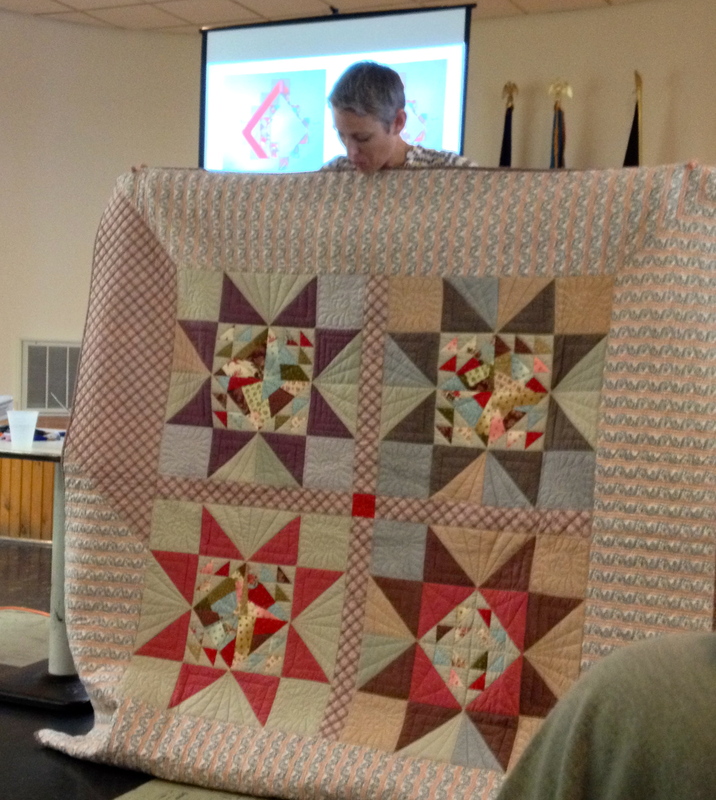 Mary is an expert on antique quilts and fabrics. She works with Windham fabrics to reproduce 18th and 19th century fabrics and that is primarily what she sells in her shop. She is a gracious hostess and made us feel right at home in her fabulous retreat space. 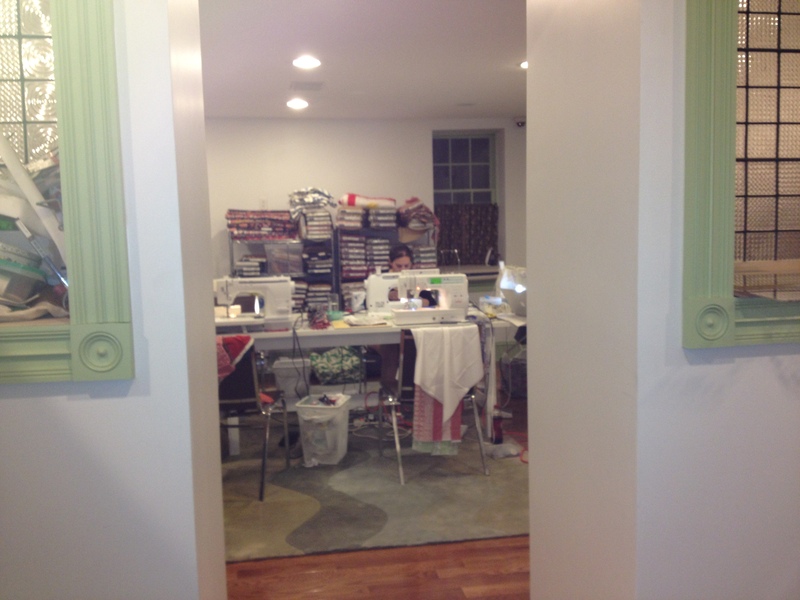 We had a room on the ground floor to do our sewing. 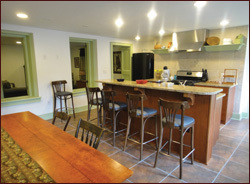 A living room and kitchen on the first floor. 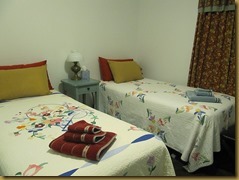 And bedrooms complete with antique quilts on the beds on the second floor. Bedroom in the retreat space. Photo by Anjeanette Klinder. We spent two days working on our own projects. For dinner on both nights we went to a restaurant down the street called the Birds Nest. I’m sure there are other nice restaurants in Bedford, but we were so impressed with the dinner the first night, we decided to go back instead of trying another place. Sunday afternoon, Mary hosted a lecture and trunk show by Victoria Findlay Wolfe. 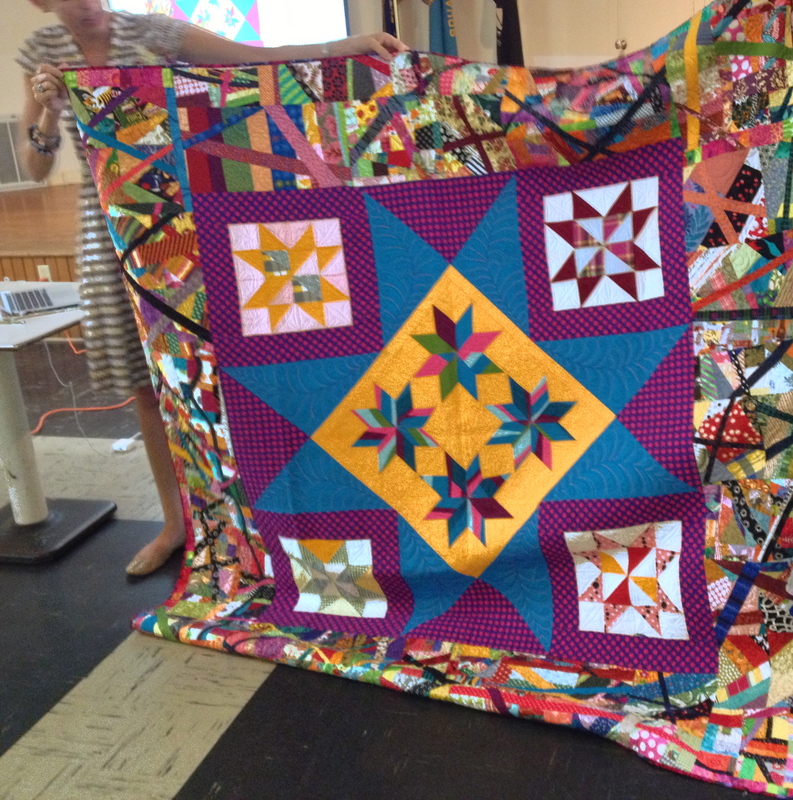 Victoria is the author of the book 15 Minutes of Play and one of her quilts won the best in show at the Modern Quilt Guild’s first show – Quilt Con. 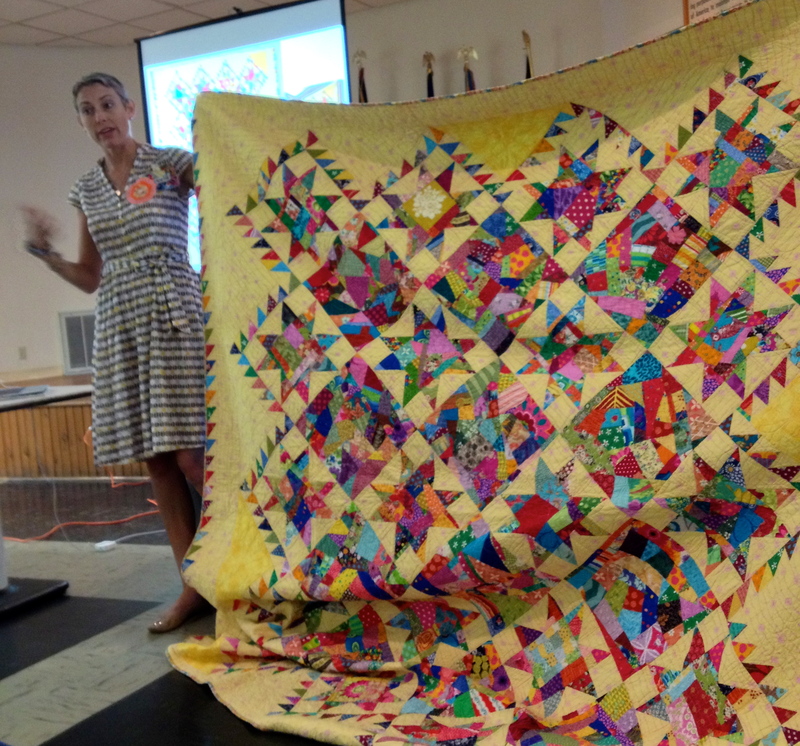 She did not have that quilt with her for the trunk show as it is currently hanging in Houston, but she did show us some process pictures of making it and this youtube video shows her telling about it. 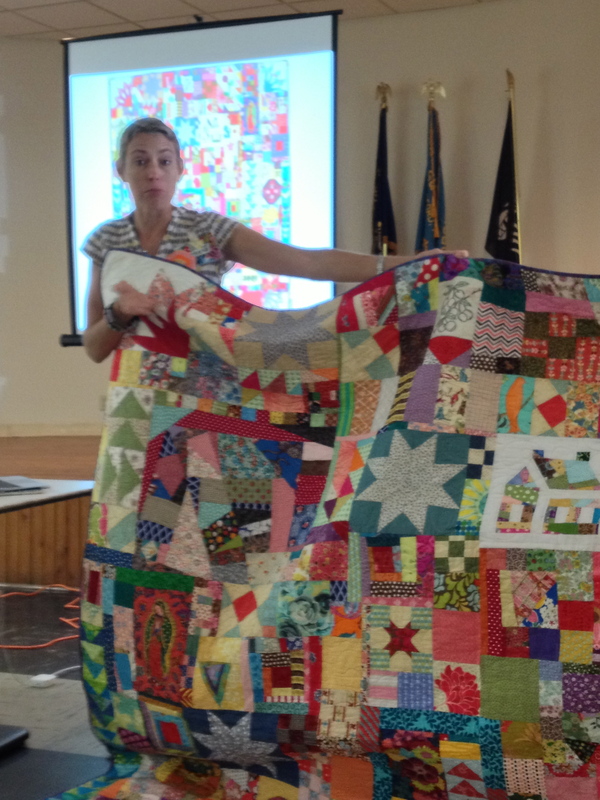 She did have many, many beautiful quilts to show us. It was a pleasure to see them and to get to know her a little bit. 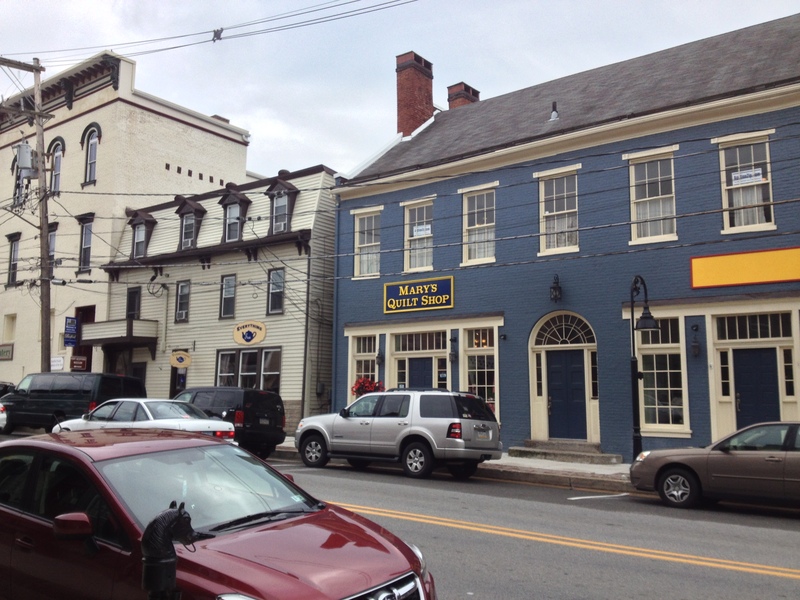 Bedford, Pennsylvania is a quaint little town and Mary’s Quilt Shop and Retreat is a wonderful place for a nice little get away. I highly recommend it if you live in the area or near the area. It was about a two and a half hour drive from where I live in Washington, DC. 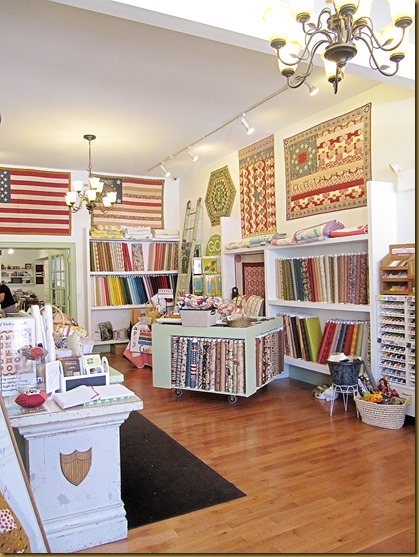 Thanks for your recommendation and wonderful description of Mary’s Quilt Shop. 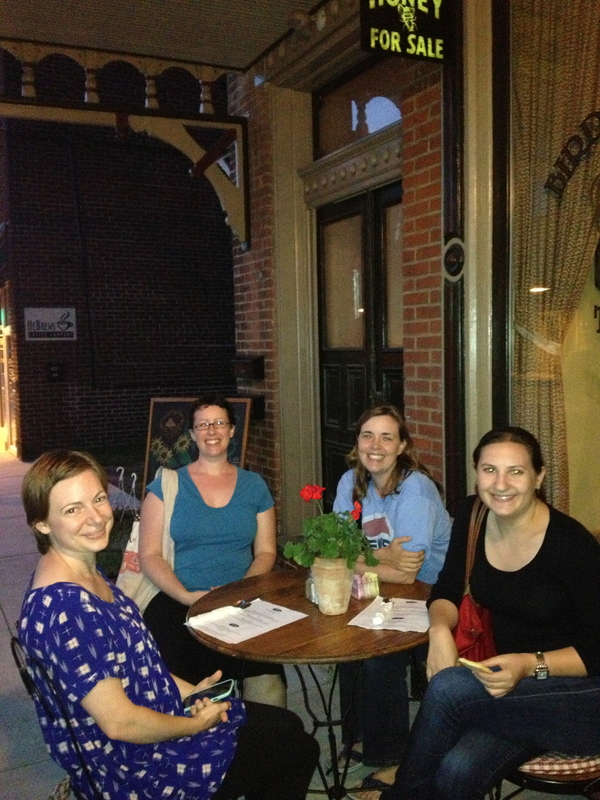 An opportunity for another great quilting adventure! It truly is a nice little get away, whether you are a quilter or not. I think I will go with my husband sometime in the future. great pictures, great story telling, and it seems like it was a wonderful retreat. 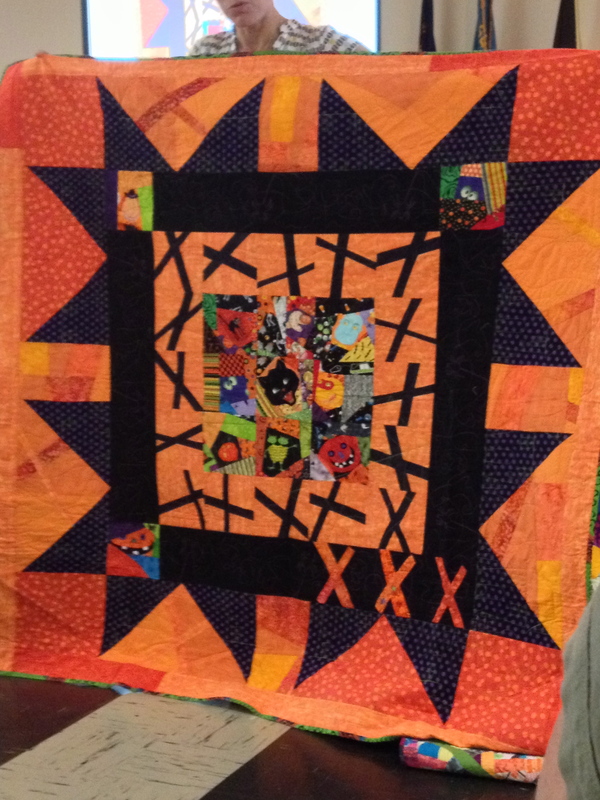 I am inspired just looking at the quilts, setting and smiles of happy quilters. Thanks for bringing it all back to us lurkers. Sounds like a wonderful trip, Linda. Is Mary Koval related to the Kovals who are antique experts? I’m not sure about this. She is certainly an expert about antique quilts, but as far as other antiques and her family, I don’t know! That could well be so. 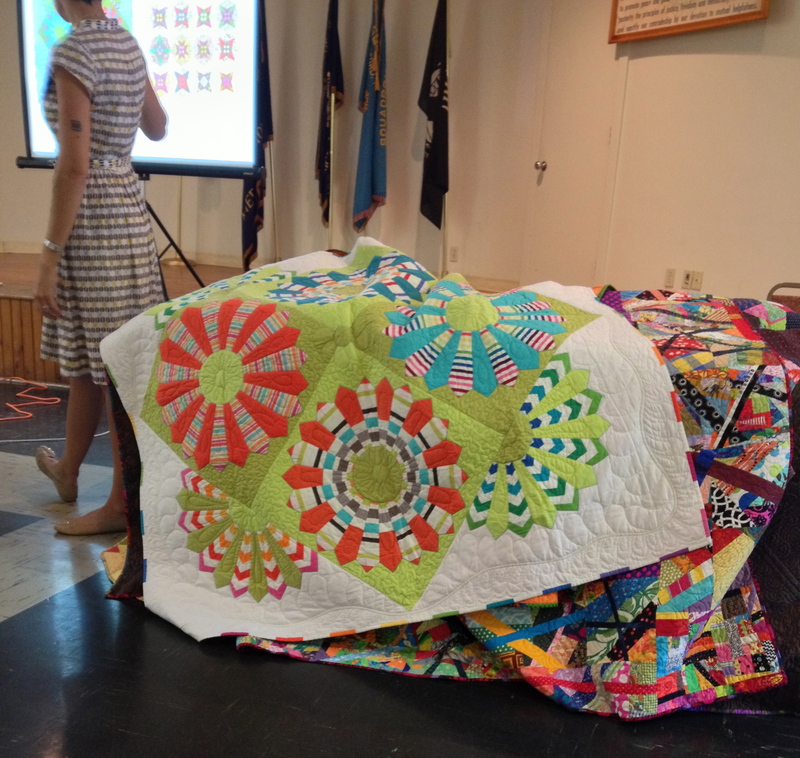 And, I love the colorful quilts done by Victoria Findlay Wolfe! I’m glad you had such a great time! I was sad I was out of town. We wish you could have been there. It was a great place for a small retreat or even a family get away. Looks wonderful! I wished I could have been there. It feels like a million years ago already! It was such a lovely time though, I won’t forget it! A perfect write-up! It was truly a special weekend with special people.